Stop Talking! I Want A Divorce. My spouse and I have finally decided to get divorced. What do we do about the house? Sitting in consultation with your attorney, still upset from the earlier conversation you had today with your soon to be ex-spouse, your attorney tells you your husband wants to keep the house, and he wants you to move out. You think to yourself “over my dead body,” but you know deep down you can’t afford the monthly payments on your salary. He’s asking you to move out of the house. What about the kids? Who gets to keep the dog? 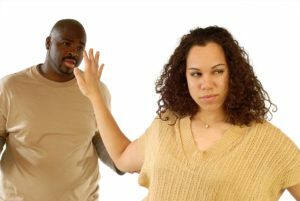 That emotional spark that was missing from your marriage is now being channeled into anger and resentment toward your spouse. Right now, your head is spinning, but these are just some of the many things you’ll have to sort out before you move forward with your divorce. The house that you bought together can be replaced, and frankly, it will never be the same after the divorce. Unfortunately, we see far too many couples who need to sell their homes because of a divorce. It may be hard to believe now, but you will eventually heal and find new happiness with time, but that may require you to move to a new home. Whatever you decide, continue to make your mortgage payments until your divorce is final. If you can’t make your mortgage payments, seek legal counsel fast, before you get too far behind in your payments. You don’t want to keep living together because you can’t afford to live apart, or because your credit is ruined and no one else will rent to you. Do you remember how difficult it was to have the conversation about divorce? Well, the discussion around what happens to the house won’t be much easier. If you need a confidential “cash contract” with no obligation, we can help. We hate divorces, but we love helping people who need help with clearing a path forward. The most straight-forward approach is to list the house and sell it. You can pay off your mortgage, split any equity you’ve built up, and move on with your separate lives. Selling the home is the most practical strategy if neither of you can agree on who gets to keep it, or if neither one of you would be able to afford mortgage payments on your own. Would I Buy This Home? Does this home need to be updated? Is the plumbing Copper or PVC? How old are the carpet, light fixtures, and ceiling fans? Any foundation, electrical, or plumbing issues? These are just a few of the questions a new prospect will ask, and not even close to what an inspector is going to require. Homes with low equity or no equity can still be sold, either through a short-sale or by working with an investor who specializes in those types of transactions. With a short sale, the bank agrees to let you sell the house for less than you owe, while the bank takes the loss, your credit may still be affected after the sale is completed. Even with the worst kinds of problems like foundation and mold, “cash contract” investors will still work with you to buy the property if you can both agree on a mutual price. You may choose to make the repairs yourself and put the home on the market for full price. When you’re going through a divorce, this option can be difficult because it requires you to work with the person you’re trying to get away from, unless you hire a third party to manage the process for you. Okay, maybe you are willing to move out, but you want off the deed. Can your spouse refinance the house on his salary? To make this scenario work, the spouse who intends to stay in the house must be able to afford the new mortgage payments on his/her own. Refinancing isn’t an option, if the mortgage is underwater or if your spouse has bad credit. There is always one person who is more attached to the family house than the other. Usually, it’s the parent who will be the custodial caregiver. If this is the case, consider a buyout. If you can both agree on a fair price to “buy out” your interest in the property in exchange for cash, this option works well, especially, when you have children. If you don’t have the cash, then look at ways to split retirement accounts or insurance policies instead of cash upfront to buy out your spouse. What if you can’t sell your house? Maybe you live in an unpopular area, or you own a home with special restrictions like a historic home. Maybe your home is just “ugly,” but you’re in love with it because you inherited it from your grandparents. Co-ownership of a home can last a lifetime between spouses. During the divorce, the court may want a “sell-by” date included in your divorce agreement. However, the sell-by date can be 20 or 30 years, and you can always amend the date down the road. Choosing this option means you will have to be explicit in the agreement about maintenance cost, interest deductions, liability, and the impact that a co-ownership will have on your credit. A good attorney will help you sort through these types of questions. Why on earth would any sane person want to become a landlord? I say that half-jokingly, because yes being a landlord can be difficult, but it can also be rewarding. It depends on your personality, motivations, and your ability to manage the rental unit and the tenants. As long as you can find responsible tenants, this can be a great situation. It can buy you time to sell, and you will continue to build equity while your tenant pays off your mortgage. As long as you have positive cash flow, and we strongly suggest you do, then instead of the rental hurting your debt-to-income ratio, it will help because your rental is additional income rather than an extra expense. Evaluate your financial circumstances and goals as you consider your alternatives, and then discuss with your spouse which scenario makes the most sense for you. If you have any questions about real estate or selling your home, call or send us an email.